One of my favorite dinners to make because it is so simple and so good. This is a great recipe for roast chicken as you can taste just a touch of lemon. 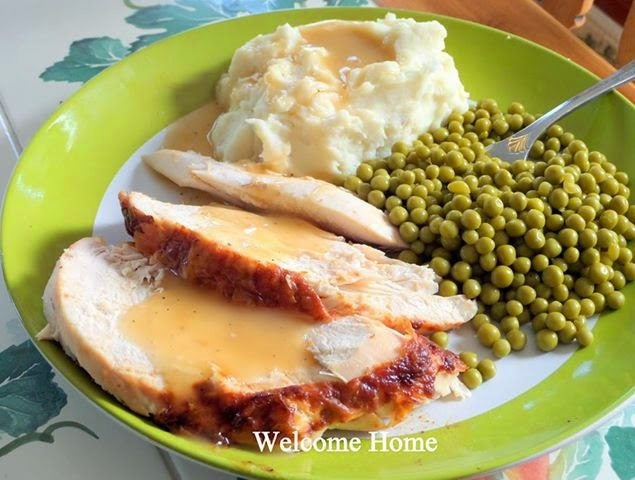 My Dad says I made the creamiest mashed potatoes and fresh peas are always a great si...de. Doesn't this just spell comfort food? Preheat oven to 425 degrees. Zest two of the lemons. Strip the leaves off of one of the rosemary sprigs and chop it up finely. In a bowl, combine softened butter, lemon zest, rosemary, and salt and pepper to taste. Line a baking sheet with heavy duty aluminum foil and lay the patted-dry chicken on the foil, breast side up. Use your fingers to smear the butter mixture all over the chicken, under the skin, and inside the cavity. Cut the lemons in half and squeeze the juice of one lemon all over the chicken. Place the six lemon halves (if they'll fit!) and the three remaining rosemary leaves into the cavity of the bird. Place the chicken into the oven and roast it for 1 hour, 15 minutes or until done. Skin should be deep golden brown and juices should be sizzling. In a large pot, bring 8 cups of water and 1 tablespoon of salt to a boil. Add potatoes and cook uncovered for 20-25 minutes, until the potatoes are tender when pierced with a fork. Drain potatoes very well in a colander and transfer them back to the pot which will dry them out a little more. Add butter and milk and whip at medium low speed with a hand mixer until smooth and creamy. Feel free to add more butter and milk a little at a time to get the consistency you want. Season with salt and pepper while mixing. In the bottom of the baking dish after roasting the chicken in the oven. Pour the drippings into a large sauce pan. If there is lots of fat skim some of it off. Heat the drippings up, over medium- heat and bring it to a boil. In another bowl add 1 tablespoon corn starch to 1/2 cup of cold water. Mix till all the lumps are out of the corn starch and it is well mixed… then you can slowly add it your chicken drippings. Whisk the whole time, to prevent lumps. Stir at a full boil for 1 minute, then turn heat off and let stand for 1 minute. Salt and pepper to taste. Serve over chicken and mashed potatoes.